The Dulatown Presbyterian Church Food Pantry remains motivated to be proactive in the fight against hunger and the mission to treat every client with respect and compassion. The reality is that hunger is a problem that has affected more people in the past few years than ever before. The number of people seeking assistance for food has increased substantially. This alarming trend is illustrated by the ever increasing number of clients who are requesting assistance for food. Based on the statistical documentation of staff volunteers of the Food Pantry, they have seen a 200% increase in need. 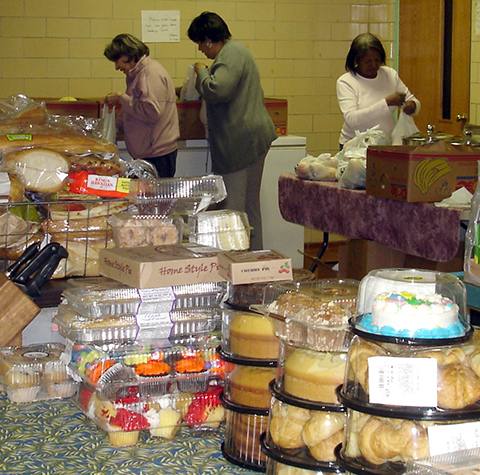 Dulatown Presbyterian Church Food Pantry is an advocate for the poor and those who are in need in the community of Caldwell County. Neediness arouses compassion of God – and action from us. We welcome volunteers to this ministry! The Coffee Shop Ministry is an outreach to the community and other churches that will provide spiritual guidance during the noon day hour. 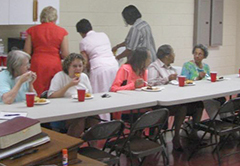 It is approximately one hour long and it allows its’ participates to come and enjoy a free lunch as they discuss the spiritual topic of the day. For those who can spend more than an hour there is additional fellowship in the form of games and good conversation. KOSS4kids (Keeping Our Streets Safe for Kids) is an eight hour work shop for children in Caldwell county, ages 8 to 16 years old, that will address children’s rights, what to do if stopped by a police officer, what to do if you have to report a sensitive issue to authorities, what to do if you have seen a tragic incident that is causing depression that may lead to suicide, and last but not least a segment on ‘Good touch, Bad touch. KOSS becomes an informative work shop that will arm the children of the community about the issues that are affecting their lives. If children are given the proper information then we stand a chance of providing a healing and caring environment filled with hope. Written By: James MacDonald & Barb Peil Instructor: Minister Alecha Boston Location: Dulatown Presbyterian Church Time: Every Monday evening from 6:30pm to 7:30pm. What does God think about attitudes? This study uses examples from the Israelites’ journey out of Egypt to how attitudes can affect whether someone stays in the wilderness or enjoys the blessings of the Promised Land. There is hope for the attitudinally challenged. In this study, Pastor James MacDonald shows how you can lead others (and even yourself) out of attitudes God hates and into those He honors.